No. 308. There was a lad was 6orn in Kyle. 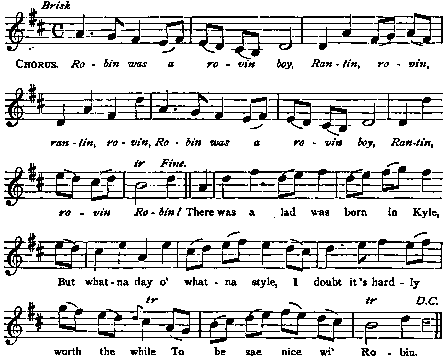 Tune : Dainty Davie McGibbon's Scots Tunes 1746, p. 32. Rantin, rovin, rantin, rovin, Robin was a rovin boy, Rantin, rovin Robin ! There was a lad was born in Kyle, But whatna day o' whatna style, I doubt it's hardly worth the while To be sae nice wi1 Robin. ane Was five-and-twenty days begun, 'Twas then a blast o' Janwar win' Blew hansel in on Robin. The gossip keekit in his loof, Quo*scho 'wha lives willseethe proof, This waly boy will be nae coof; I think we'll ca' him Robin.
' He'll hae misfortunes great an'sma', But ay a heart aboon them a' ; He'll be a credit till us a'; W'll a1 be proud o' Robin. Guid faith, quo' scho, I doubt you, sir, Ye gar the lasses lie aspar, But twenty fauts ye may hae waur, � So blessins on thee, Robin !